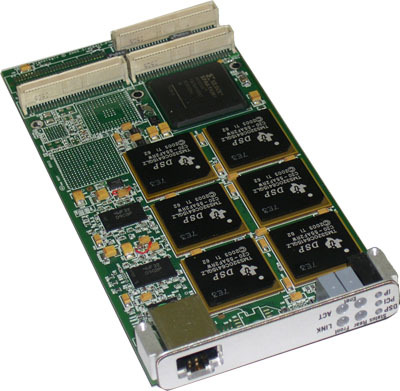 The SigC641x card combines a Spartan 3 FPGA and DSP array to perform real-time video and image processing. 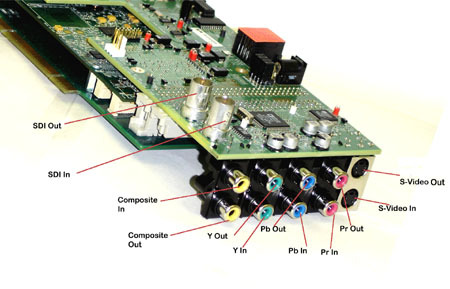 The DSP array scales from one to eight (8) 1 GHz Texas Inst DSPs, with direct access to digital and analog video I/O, including SD and HD SDI, and DVI digital video I/O, several types of analog video I/O, and a camera link interface. 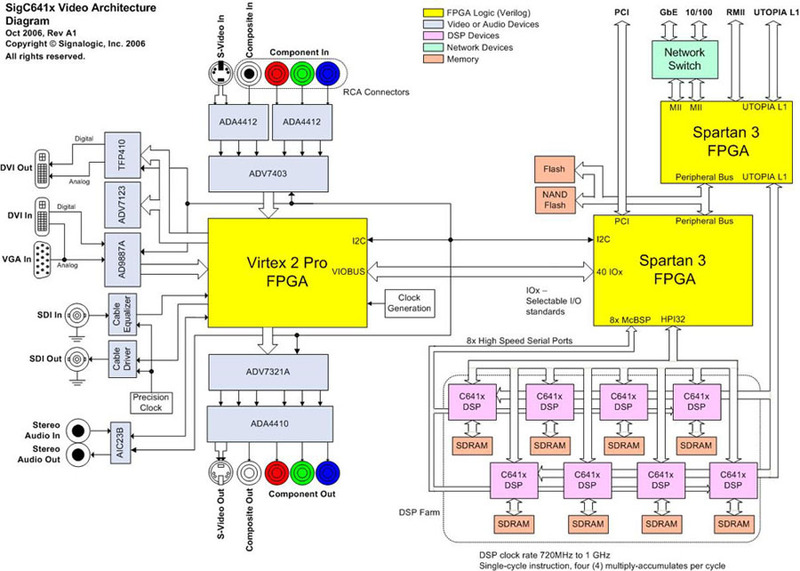 Video I/O data may be pre-processed by both the Virtex II FPGA and the Spartan 3 prior to DSP farm processing. Digitized video is transported via 32-bit data path containing pixel data in various RGB, chroma + luma, and other formats. DSP array processing is distributed; video I/O data may be transferred to any combination of DSPs in any sequence, under FPGA logic and/or software control. DSP interprocessor communication is implemented via high speed serial interface, routable between any combination or pattern of DSPs under software control. Separate, physically independent data paths are available for transfer of DSP results to/from host software over PCI bus and for transfer of digital video data over PCI bus (see block diagram below). 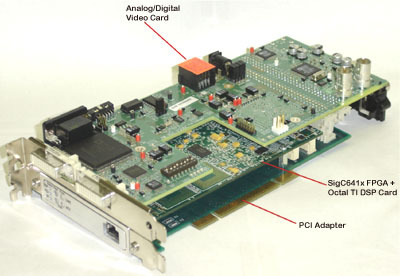 Below is an architecture diagram of the SigC641x plus analog/digital video card solution. 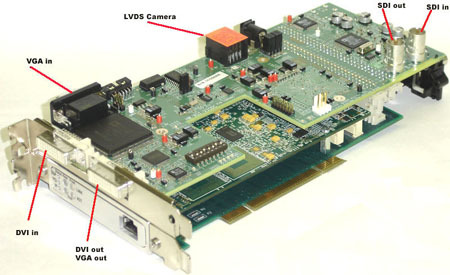 Real-time video and image processing may occur in FPGA logic both before and after DSP farm processing. DSP farm processing scales from zero to eight (8) Texas Instruments C641x devices, running at clock rates from 720 MHz to 1 GHz. 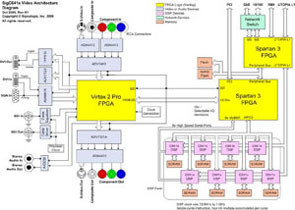 Below are preliminary specifications for the SigC641x and video coprocessor card combination. All specifications are subject to change. The SigC641x plus analog/digital video card solution is currently in alpha status and not yet in production. Single qty, off-the-shelf systems are not expected to be available until 3Q08. For customers interested in obtaining and working with a alpha system, we may require an NRE charge and/or minimum qty order, depending on what functionality is required by the customer application. If this option is of interest, please call and mention this web page to speak with engineering staff and obtain updated project status and pricing. 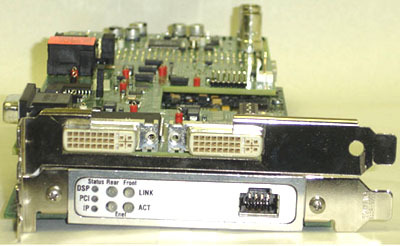 The SigC641x-PTMC card provides a high-speed signal processing solution for VoIP and wireless applications on a variety of platforms, including cPCI, VME, desktop PC, and stand-alone. It can also be used with a PC104+ adapter. Click here for detailed information on the SigC641x-PTMC board.